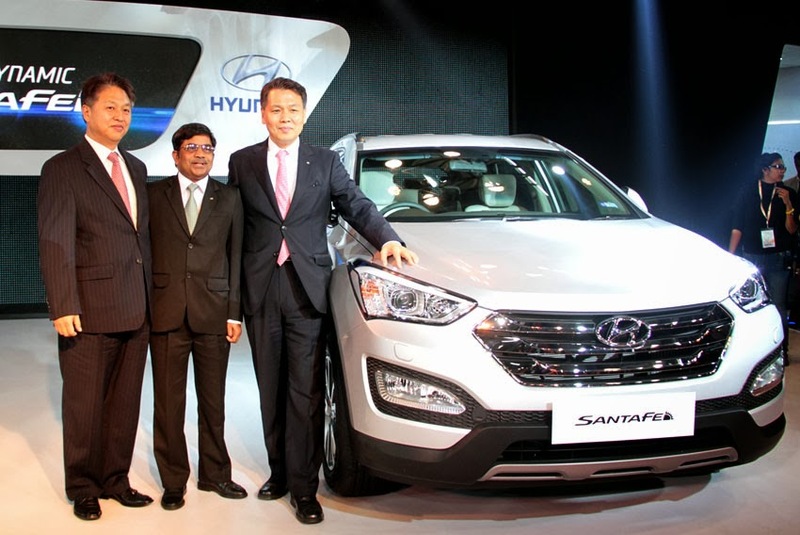 Hyundai Motor India Limited (HMIL) announced the launch of third-generation powerful and dynamic Santa Fe at the 12th Auto Expo in Greater Noida. SUV segment. The new Santa Fe is one of the finest expressions of modern premium with high level of performance, power, styling, technology and equipment that demonstrates Hyundai's capabilities and confirm its commitment of value beyond expectation to customers," said B.S. Seo, Managing Director & CEO, HMIL. The new Santa Fe is powered by third-generation 2.2L CRDi engine equipped with e-VGT turbocharger. The advanced third-generation CRDi diesel is Hyundai's 'R' series engine which delivers 197 ps @ 3,800 rpm of maximum power and an impressive torque of 42.9 kgm @ 1,800-2,500 rpm (MT) and 44.5 kgm @ 1,800-2,500 rpm (AT) with high mileage of 14.74 kmpl (MT-ARAI certified) and 13.01 kmpl (AT-ARAI certified). The Electronic Variable Geometry Turbocharger (e-VGT) is efficient and has precise control of exhaust gases for optimal power delivery across all rpms thus improving the engine performance. The CRDi engine operates at a high pressure of 1,800 bar and generates high low end torque resulting in lesser gear shifts in city driving conditions. The linear power delivery and with maximum torque over wide range of rpm's ensures instant response at any speed . Available in 6 speed - manual and automatic transmission offers higher driving pleasure with enhanced fuel efficiency and refinement with intelligent 4 -wheel drive system. The new Santa Fe embodies the 'Storm Edge design philosophy' derived from Hyundai's Fluidic design philosophy which captures the strong and dynamic images created by nature during the formation of a storm. Featuring sophisticated and refined lines which are in harmony with its bold and voluminous surfaces, the Santa Fe presents a more masculine appearance. The new Santa Fe showcases a dynamic and futuristic sporty styling. It features a distinctive new look with the stunning three-bar hexagonal front grille complemented with striking headlamps & LED daytime running lights. The headlamp cluster has many unique features like bright HID LED Lamps and fog lamps with cornering function giving optimum safety. The sporty chrome radiator grille and dual-tone skid plates give an enhanced sporty image and a premium appearance to the car. For a sportier and impressive appearance, Santa Fe comes with segment unique 18-inch 2-tone diamond cut alloy wheels. Sleek styling makes the Santa Fe aerodynamic and roof rails help define its clean side profile, while adding to SUV functionality. Wheel arch side garnish gives masculine & distinctive styling and the chrome finish Daylight Opening (DLO) offers luxurious & premium appeal. The segment unique exterior features give unique style and futuristic looks. The unique features include LED rear combination lamps and large bumper reflectors. The LED rear spoiler, twin muffler & rear skid plate give dynamic and premium appeal. The premium interiors with the brilliant packaging of the new Santa Fe have been further accentuated to provide a wide sense of space and high quality finesse. The new Santa Fe offers spacious cabin with optimum headroom, generous front and rear legroom along with a large luggage space of 585 litres. The 2-tone beige and brown interior gives premium and luxury touch to the interiors of car. Santa Fe makes sure the driving experience comes with a pleasure by providing the multi-function steering wheel, leather wrapped gear knob, multi-function door arm rest with ergonomically positioned center fascia controls. Presenting the segment unique features and the effective space management, the new Santa Fe offers three-row seven-passenger seating. The third row seat is split 50/50 and can be folded flat. The second row is 40:20:40 split. Total cargo space is generous with plenty of storage for items of different sizes. The second and third row seats can be reclined and fully folded for greater comfort and for additional cargo space hence providing a versatile seating arrangement. The 12-way driver power seat, rear door manual curtain and flexible seating configuration provide an added advantage on long drive and holiday trips. Hyundai has always led the way when it comes to ensuring safety and security of passengers. The new Santa Fe offers advanced cutting-edge preventive safety systems offering driving stability requiring minimum effort on the part of the driver, yet delivering maximum safety on any road conditions. The new Santa Fe offers 6 airbags & advanced dual seat belt mechanism for uncompromised safety with state-of-the-art passive safety system unique to SUV segment. The new Santa Fe offers three layers of safety with ABS (Anti-lock Braking System), ESC (Electronic Stability Control) and VSM (Vehicle Stability Management) ensuring optimum safety during panic braking at different terrains. Santa Fe comes with premium safety features Brake Assist (BA) to ensure greater driving stability. The hill start assist and down hill brake control assists the driver in maintaining the vehicular control by preventing incline roll-back and steep forward movements. Santa Fe also offers easy mounting and securing features with lock for added safety for baby on board. The new Santa Fe offers host of advance and hi-tech features like cruise control, smart key with push button start and stop for keyless entry/exit and ignition on/off, rear parking sensors with camera, auto folding outside mirrors which automatically opens and folds when the car is unlocked and locked. The solar glass protects the interiors against ultraviolet & Infrared rays while preserving cool cabin temperature. The tilt steering offers the most comfortable driving position while the cooled glove box keeps the beverages and food items cool & fresh. Additionally, it also offers puddle lamps, rain sensing wipers and safety power windows. The segment first feature, flex steer allows the driver to switch among 3 steering modes - comfort, normal and sport depending on road conditions and driver preferences. The new Santa Fe features advanced Infotainment audio system for music loving Indian customers with unmatched audio experience with 6 speakers with virtual orchestra effect. The Santa Fe offers many infotainment features - 4.3-inch TFT LCD Touch with rear-parking camera display, Bluetooth, USB, MP3, CD compatibility and Aux-in connectivity along with steering mounted audio controls for unlimited music and phone access. The new Santa Fe offers customised effective cooling of air through the dual-zone fully automatic air-conditioning, dedicated rear manual AC for rear passengers which enhances the cooling effectiveness during peak Indian summer conditions. In addition to this new Santa Fe also features cluster ionizer for clean cabin air and auto defog controller for extreme winter conditions. The new Santa Fe will be available in a range of 5 new colours.